I have talked to you before about my super high low tech way of keeping data, but I wanted to show you again for this linky full of great ideas for how to collect your data. Plus, I added a freebie! My way of keeping data is super simple. I just have a manilla file folder for each student that I keep in a drawer with green hanging files for each day. I write the name of the student and the days of the week that they attend sessions on the tab. 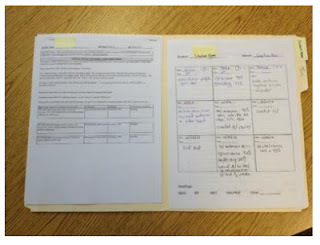 Then, I put a copy of their goals on the left side of the file folder and keep a data sheet open on the other side. I also put any worksheets, notes from parents, or other items in the folder for daily use. At the end of the year, I take out the data sheets and any other items that need to be saved and place them in the students' main file. To keep data, I use a +/- system. First, I write a quick detail of what we are working on (in the sample it is /s/ initial). Then, I give the student a plus for a correct production and a minus for incorrect. If the production is heavily prompted, I will circle the plus sign. After ten products, I put a slash mark so that the productions are easier for me to count later. You can get a copy of my simple data sheet HERE. Thanks for checking out my way of collecting data! Hopefully you will click through the rest of the great bloggers in the linky to see their ideas too. 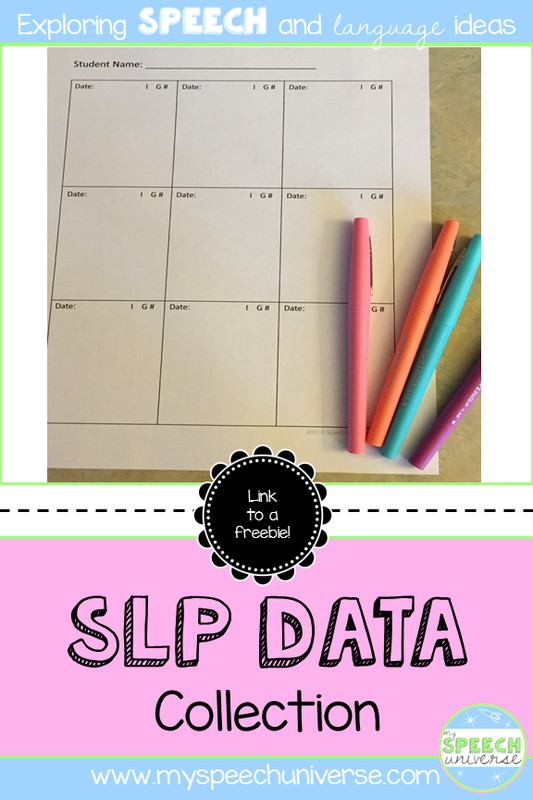 I use colored flair pens, too, but for lesson planning! I keep data in pencil. I'm not sure why, though! I use a different color per month. I know. I'm weird! Flair pens rock the speech world! I love your system, so all inclusive! Makes me want to change back to my earlier days, but use your form! That's why this community is great, so many ideas and motivation to boot! !